A man on a "packed" tram in Manchester was furious after he reported a suspicious package. The driver did "nothing" initially, but then asked passengers to carry the package to him. The incident happened on 20 February 2018. The first of two days of severe disruption which ended with worried travellers and fresh criticism of inconsistent security procedures on the network. 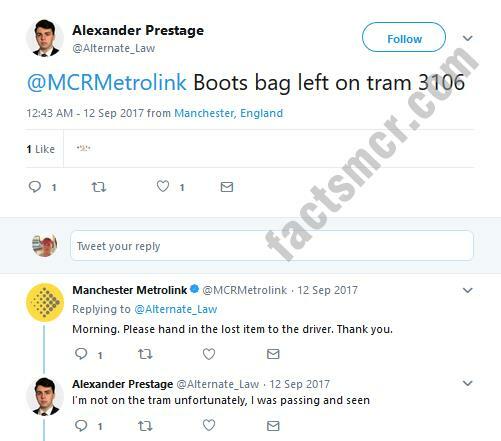 The desperate passenger took to Twitter to plead with Metrolink to respond to the abandoned bag. The tram carried the suspect package from Victoria at around 9:45am, just nine months after a terrorist atrocity killed twenty-two people nearby. 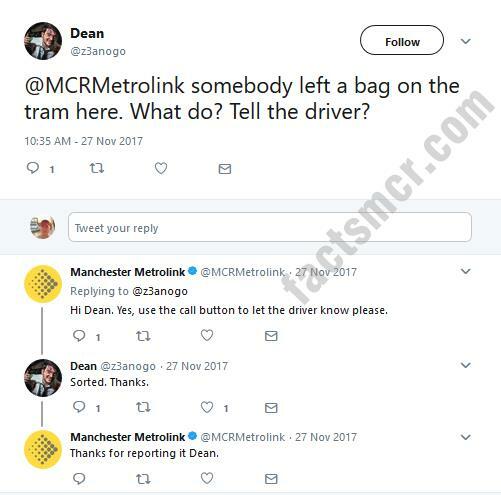 But the driver ignored the passenger's emergency intercom warning, continuing through the city centre towards East Didsbury. 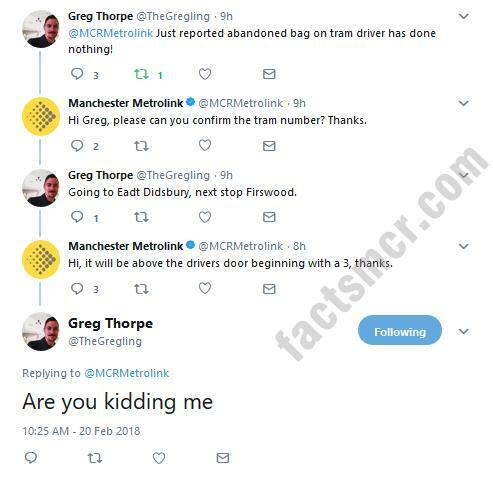 Vigilant passenger Greg Thorpe also found the @mcrMetrolink Twitter account unhelpful. They told Greg that they needed him to obtain the tram number displayed above the driver's door, but he was unable to get to it on the busy commuter tram. Other Twitter users expressed concern about how the incident was handled. 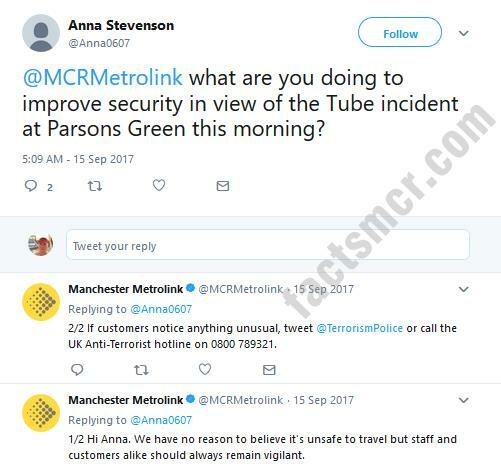 Just five months after a bomb exploded on a London tube train at Parsons Green, the suspicious package protocol on Manchester’s busy network remains unclear. We've reviewed twelve months of Metrolink's dramatically inconsistent responses to similar threats and customer enquiries. Months before the Parsons Green bomb, a Metrolink driver stopped his tram to assess an abandoned bag in this incident. 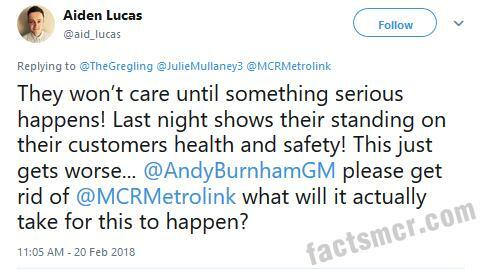 Metrolink advise "staff and customers alike" to "always remain vigilant" before asking customers to report anything suspicious to anti-terrorist contacts. 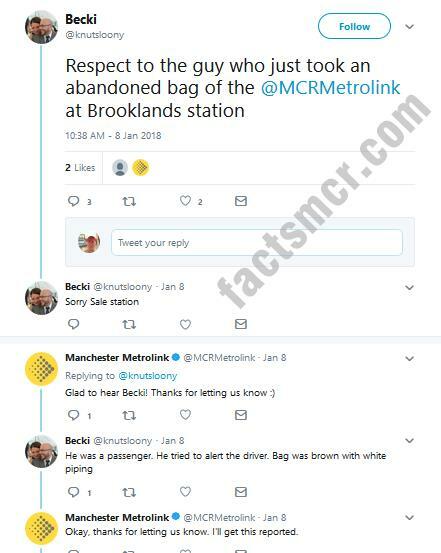 But in January a customer removed an abandoned bag from a tram himself. Here a concerned passenger is advised to report a bag to the tram driver. A passenger who saw no response to his report of an abandoned bag last November, asked Metrolink if security is taken seriously. A passenger is advised to carry this bag to the driver. Metrolink never replied to this late night Tweet. Another passenger is advised to carry an abandoned bag to the driver. 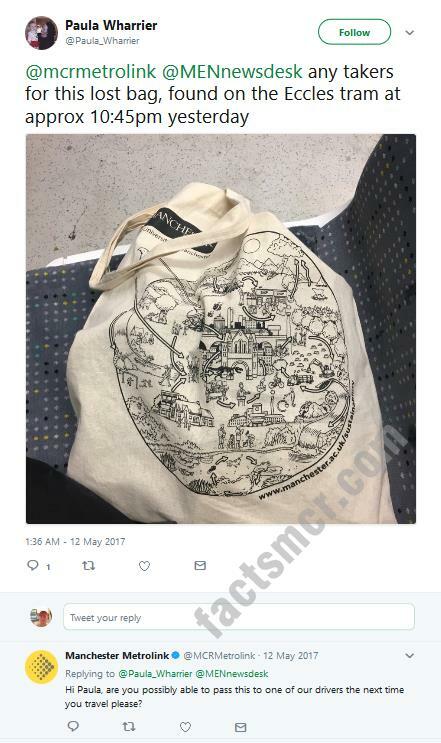 Passengers "panic" as a large bag is left in the middle of a tram. Here another passenger is asked to pass a bag to the driver. What is the official procedure on the Metrotram? Surely it can't be right for members of the public to pick up a suspicious item and walk through a crowded train or along a busy platform with it? It may be obvious to a passenger that a carrier bag of shopping is harmless lost property, however unless they leave their cab, Metrolink drivers can’t evaluate a potential threat. These reports indicate that drivers are continuing journeys or even asking passengers to handle items, on the strength of ambiguous verbal descriptions. We contacted Manchester Metrolink for comment before publishing this article. We received an acknowledgement and await a further response.